MiJET Standard Workstation single cutout. Includes table with butcher block top and wheels, enclosed..
MiJET Deluxe Workstation for 8" dia. MiJET - includes Solvent Container & Parts Basket. Includes..
MiJET Workstation table with butcher block top and wheels, enclosed 3 sides. - Angled 12" diam..
MiJET Deluxe Workstation for 12" dia. 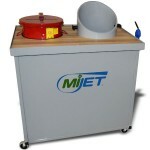 MiJET - includes Solvent Container & Parts Basket. Include..